KESMAR is a new chapter for Sydney musician Nathan Hawes. Having first picked up a guitar in 2006, Hawes spent over a decade serenading audiences with his folk tunes. He released his debut EP I Wasn't There in 2016 and played countless sold-out national live shows in support of it. Considering his musical background, Hawes' latest evolution into KESMAR comes as an eyebrow raising surprise. He's traded his acoustic guitar for swirling synths and a live band. The KESMAR project began in the studio as he delved into new collaborations and writing sessions. 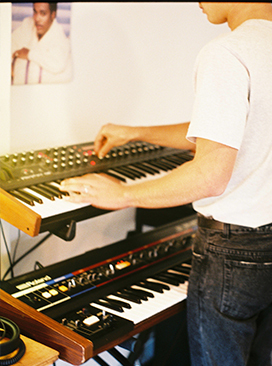 Hawes reflects that during this time he "basically fell in love with learning production and vintage synthesisers." This love lead to co-writing with indie and electronic mainstays like Lanks, Panama, Tim Ayre (Tim & Jean) and George Nicholas (Seekae) to hone his craft, while also living off a healthy soundtrack of artists like Metronomy, Roosevelt and L'imperatrice. In 2018 he released his debut single 'Feel It Again' which explores the darker side of romance. "After a relationship ends, I think a lot of us question ourselves in heartbreak, asking: Will I feel it again? Will I feel the same way I felt when we together? I turned the last line of the chorus to 'but it won't be with you,' bluntly meaning that if I ever feel it again, it will not be with you," he says. 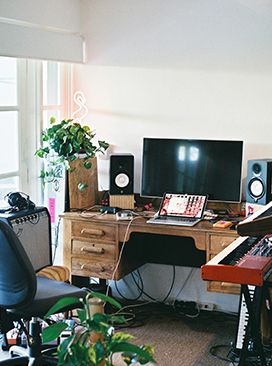 The track was written alongside Lanks in his living room in Sydney, and co-produced with Tobias Priddle in Melbourne, with obscure live percussion samples accompanied by live drums and live bass to give the project an organic flavour. 'Up to You’ is his second consecutive single release and was written and recorded in Melbourne with producer, Tim Ayre. KESMAR says “Up To You is about a relationship I was in at the time, feeling uncertain seeing it roll towards a downward spiral but feeling helpless and letting her decide where it goes - as the hook goes, 'It's all up to you.” His new single was showcased across a handful of east coast Twilight At Taronga shows in support of Vera Blue in February & March. KESMAR reflects on his journey creating music experimentally and stumbling on his new funk-driven sound, "I think when you're younger you can latch onto certain genres and specific styles and idolise pretty heavily...and this was me limiting myself"
Then he continues to reflect his need to "push creative boundaries and open my eyes and ears up to new genres...it was a necessary change to maintain the love that inspires me in music in the first place" So, in a sense, he discovered new genre and began to 'Feel It Again' (his passion for music- that is). ‘Up to You’ and 'Feel It Again' really revive the old soul of disco, in a contemporary setting. Filled with slick bass-lines, throwback synths and a solid drum groove. Debut EP ‘Up To You’ is being released Friday April 12. Read on as Nathan answers a few questions about the writing process and production. The peak was finishing a track, from demo stages, to proper tracking of drums, Synths, vocals etc.. Then to mixing and mastering. The feeling of getting the masters back made all of it seem worth while. I think the pit is just the turn around process with releasing, from the day of actually writing the track to the day of release can be so long and you can go through so many different feelings about the track in that time. So I think its just about trying to stay positive and confident with what we produced. There's no particular memories that stand out to me, mostly was excitement that I got to wake up for 3 weeks and record everyday. It was super draining but I truly love recording a body of work. Especially after demoing for a long time, you get that itch to try and record everything perfectly and how you image it. I would love to get in the studio with Michael McDonald and Benny Sings, I think some magic would come out of a session with those insanely talented guys. When writing the tracks, what came first? the music, lyrics or melody? A lot of the time it varies. Usually it will start with the music, I'll lay a drum pattern down, some chords, etc. then will just sing some gibberish into the mic then write lyrics over the top. A lot of the time lyrics inside the gibberish will come out as themes and hooks that well write the song around. Do you constantly write or is it more of an ebb and flow? Mostly constantly writing, whether it's for this project or something instrumental, or remixing. Always trying to stay creative and not get into a bubble or doing the same thing over and over again. What was the writing process like for your most recent single, 'Up To You'? 'Up To You' was written with Tobias Priddle and Tim Ayre in September 2017. This was the first time I had actually met Tij (Tobias) who I ended up producing the EP with. After doing a lot of sessions throughout the following year, I finally found someone who I felt super comfortable with and could trust with the creative direction. 'Up To You' was pretty much written that first session with Tim and Tij and we instantly knew it wasn't just another demo. How was the writing of these tracks contrary to the making of your previous EP? Coming from writing super simplistic folk, to then finding my feet in production completely changed the way I wanted to record music. I found a whole new world of production and recording I never knew existed before. Most definitely, I think everyone does, that's why I'm always trying to delve into different styles and recording techniques to keep the inspiration alive. I think the most challenging factor is just knowing when to say a song is finished. I hate deadlines but it is 100% necessary for finishing a track. If there was no deadline I think it would just go from version to version tweaking it ever so slightly. The mix and mastering is the glue. A good or bad mix can definitely make or break a track for me. It's easy to get a bad mix back and completely be off the track. It's about working through it with the engineer to get it exactly how you want it. A lot of the time it's not easy and takes a tonne of work going back and forth but once it's over to the finished production that's the most satisfying part for me. And finally your debut KESMAR EP is coming out tomorrow! How do you plan on celebrating? If the weather's nice hopefully stroll down to a local park with my house mates and drink some beers! I feel like that's always a nice way to ease into the weekend. Then maybe reflect and give that EP a listen, haha.